O Lord, our hope, You enriched Blessed Catherine with an abundance of heavenly gifts and filled her heart with You alone. With the help of her prayers may Christ be fastened to our hearts as He was fastened to the cross for our salvation. As early as 5 years old Catherine had a relationship with God to the point of having profound mystical experiences. Catherine knew she was being drawn to the Lord as his spouse and who gave her His heart. The Blessed Mother gave Catherine a wedding ring which could only seen by Catherine herself as was similar to that of Saint Catherine of Siena. 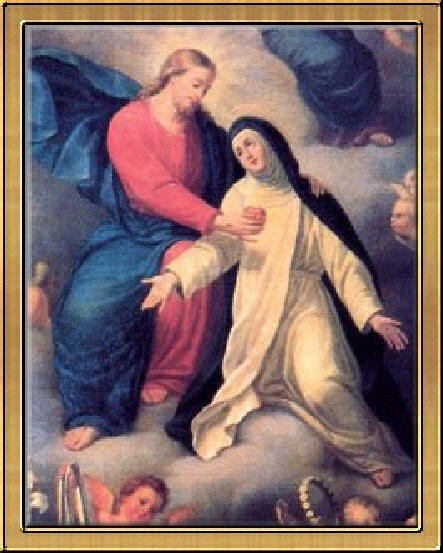 The Lord gave Catherine the grace (and burden) of the stigmata which was invisible and unknown to others except by her confessor. 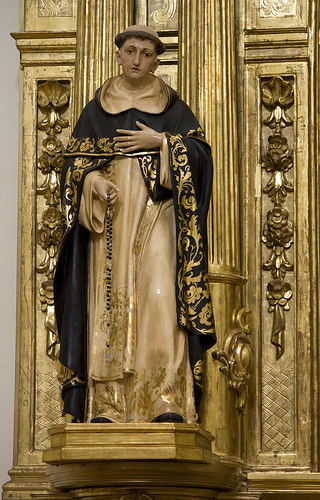 Family opposition to Catherine’s desire to enter a monastery, she instead became a tertiary (a third order Dominican); The mystical experiences were well-known to the others which the devil used to strike division among the faithful, even to the point of the Dominican friars sending her away. But sanctity won out in the end. Born in Piedmont, Italy in 1487 and died in 1574. Catherine was beatified by Pope Pius VII in 1810. What can we learn from Blessed Catherine? For me, Catherine demonstrates that we need to take seriously the religious experience and desires of the heart. God speaks to children as clearly and profoundly as He does to adults. This is the same insight Sofia Caveletti and Maria Montesorri had when they began the Catechesis of the Good Shepherd. Come, bride of Christ, and receive the crown, which the Lord has prepared for you for ever. O God, for love of You our sister Rose gave up everything to devote herself to a life of penance. By the help of her prayers may we imitate her selfless way of life on earth and enjoy the fullness of Your blessings in heaven. The amazing things happen through the saints. A case in point, Rose, after reading of St Catherine began a deeper life of penance and of faith. She cut her hair, began wearing penitential clothing and more time in a period of prayer and fasting. Rose took a vow of virginity in an effort to unite herself more closely to the Lord. 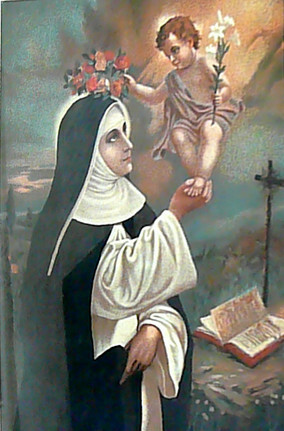 At 20 Rose took the Dominican habit and lived a more intense life of penance in reparation for offenses against God, especially in matters of idolatry that was found in Peru, he home and for the souls in purgatory. Rose was born 20 April 1586 and died on August 30, 1617. Clement IX beatified Rose in 1667 and Pope Clement X canonized Rose in 1671. Rose is the first American saint, that is, she is the first saint of the Americas. God of holiness, by the integrity of his life and gentle manner You made Blessed Jordan a fitting minister to preach the gospel. By following his example may we generously strive to serve You through service to our neighbor and so gain the fruit of an everlasting reward. Priests of God, bless the Lord; praise God, all you that are holy and humble of heart. Loving God, You chose to associate Blessed Mannes with his brother Dominic in the work of preaching. May we follow their example and remain ever fervent in proclaiming the gospel of salvation. Blessed Mannes is an older brother of Saint Dominic, founder of the Order of Preachers. Mannes was known as a humble man who lived his life in self-sacrifice for the preaching of the gospel and salvation of souls. He was sent by his brother to start a Dominincan Priory in Paris and then to Madrid. He worked with the contemplative nuns and was a famous preacher. Mannes was beatified by Pope Gregory XVI who also instructed that a set of proper texts for a Mass and Divine Office be written in Mannes’ honor. 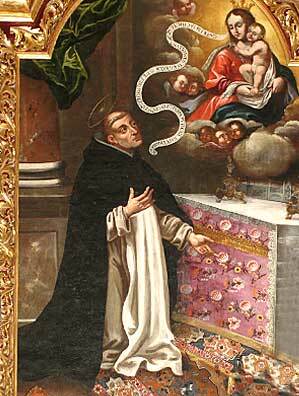 His feast day was listed as July 30th but it is celebrated today in the Dominican Order. A biography of Blessed Mannes can be read here. Proclaim the glory of the Lord among the nations, God’s marvelous deeds to all the peoples; great is the Lord and worthy of all praise. Loving God, You gave Saint Hyacinth the grace to preach, the he might draw the peoples of many nations to the light of truth. By Your power bring forth good works in our lives, that all may be moved to give You glory. The Dominican friar and priest honored today is known in Poland as the Apostle to Poland (or “to the North”). Hyacinth was born in 1185, joined the Order of Preachers in 1219 after meeting Saint Dominic becoming the first to receive the habit; he died on the Assumption feast in 1257. Prior to meeting the Order Hyacinth took earned the Doctor of Law and Divinity degree from the University of Bologna. His vocation was preaching as an itinerant missionary who had a special devotion to the Blessed Virgin Mary. Hyacinth was canonized by Clement VIII in 1594. Culturally, the name Hyacinth is translated as Jacek (in Polish) and Jacinto (in Spanish and Portugese).